ENHANCE YOUR BATHROOM SPACE WITH CONVENIENCE AND STYLE! If you have a bathroom with no cabinets, then Richards Homewares Toilet Paper Reserve is a must have. has feet to keep the toilet paper off the floor, and has a compact design that fits in the corner perfectly without getting in the way. The open design makes it easy to access the bottom roll or to add more rolls of toilet paper. The durable, Satin Nickel finish will look great in many bathroom decors. Never Run Out of Toilet Paper Rolls Again! It’s a great way to add a touch of elegance and class to your restroom space! for their plastic grocery bags in their kitchen, storage rooms, RV’s and campers. Do Not Think Twice - Just Go For It! You will not regret having this wonderful toilet paper holder in your bathroom as your guest will always leave with an extra compliment. Hit the ‘Add to Cart’ tab now before we run out of our stock. 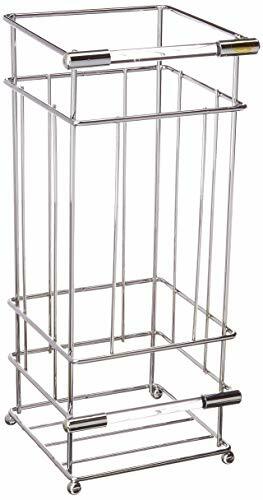 GET A NEW MODERN CONTEMPORARY BATHROOM ADDITION - This Richards Homewares beautiful, sleek, toilet tissue paper storage rack features a beautiful, and modern Squared and crystal acrylic design that will add elegance and a creative flair to any bathroom style. Easy to maintain, no parts needed to assemble, and requires no hardware, will have your bathroom transformed in no time to feel like in a 5-star hotel bath room or spa. ADD CONVENIENCE AND TREND TO YOUR BATHROOM - Modular in design, the free-standing paper holder, keeps toilet tissues close by while allowing for quick and easy bathroom floor cleaning. It can be positioned anywhere around the toilet bowl area for easy access, small and portable for compact spaces, guest room, master bedroom, or as a paper towel holder for the kitchen. STURDY AND ELEVATED BASE TO PROTECT YOUR TOILET FINISH - We created this upright free-standing toilet paper holder with an elevated sturdy base; to ensure the reserve toilet paper stays fresh, sanitary and ready to use at all times without falling over. Keep your bathroom well stocked while adding style as well. The holder has a raised base to ensure that the extra Toilet paper rolls remain sanitary, clean and ready to use. SUPER VERSATILE FOR ALL AROUND HOME DECOR - This elegant look holder for paper rolls can hold several rolls of toilet paper or 1 roll of towel paper in the kitchen, neatly storing them in one beautiful pile to prevent any clutter and mess in your bathroom or the kitchen. It's a great way to add a touch of elegance and class to your household space! CONVENIENT SPACE-SAVING - Our vertical holder measures at approximately 6.13 x 6 x 14.25" inches and is super lightweight. Great for conveniently keeping extra toilet tissue rolls organized in any bathroom with pedestal sinks, small and portable for compact spaces, guest bathroom, master bathroom, regular bathroom, or as a paper towel holder for the kitchen.